New Ghost in the Shell: Stand Alone Complex wallpaper. I was lately thinking that I have made too many 一騎当千 (IkkiTousen) wallpapers and that I need to start making more wallpapers for other series. 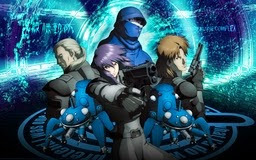 So I started with my most favorite series, 攻殻機動隊 STAND ALONE COMPLEX (Ghost in the Shell: Stand Alone Complex). The idea for this one was pretty simple, Motoko front, Togusa & Batou beside Motoko, Laughing Man behind her and on top. To think out exactly how the background should look have take me some time. All the work on the wallpaper was not so hard like thinking out the name. After hard thinking I have came up with the name "The Laughing Man Incident". Series: Ghost in the Shell: S.A.C.